Download "TN No: 09-024 Supersedes Approval Date:01-27-10 Effective Date: 10/01/09 TN No: 08-011"
1 Page 15a.2 (iii) Community Support - (adults) (CS) North Carolina is revising the State Plan to facilitate phase out of the Community Support - Adults service, which will end effective July 1, Beginning January 1, 2010 through July 1, 2010, the state will continue to allow only the provision of the care coordination functions of this service (i.e., the 3 rd and 4 th bullets on Page 15a.2 and the 14 th through 19 th bullets on Page 15a.2a) in order to permit the state time to plan for and arrange alternate services for recipients. Community Support Services consist of mental health and substance abuse community based, rehabilitation services and interventions necessary for and an individual to achieve rehabilitative, sobriety, and recovery goals. This medically necessary service directly addresses the recipient s diagnostic and clinical needs that are evidenced by the presence of a diagnosable mental illness and/or substance related disorder (as defined by the DSM-IV-TR and its successors), with symptoms and effects documented in a comprehensive clinical assessment and the Person Centered Plan. The services are designed to: Enhance skills to address the complex mental health and/or substance abuse symptoms of adults who have significant functional deficits in order to promote symptom reduction; Assist recipients in acquiring mental health and/or substance abuse recovery skills necessary for self management and to address successfully vocational, housing, and educational needs. 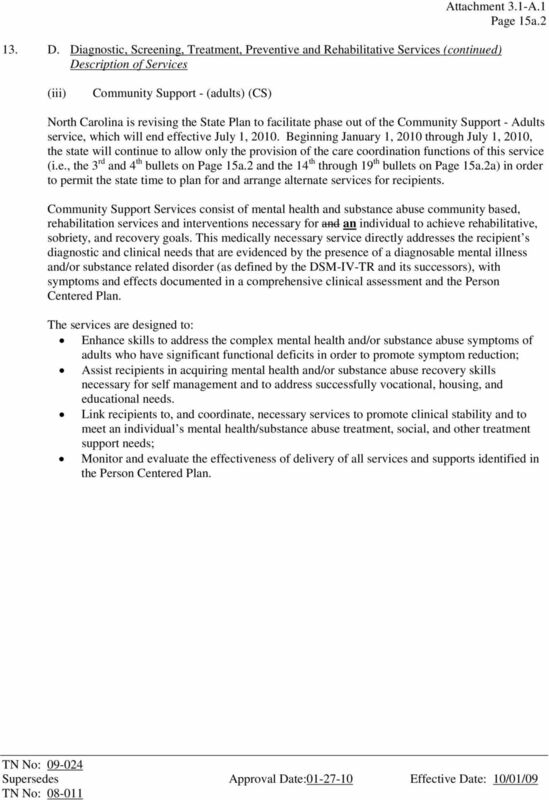 Link recipients to, and coordinate, necessary services to promote clinical stability and to meet an individual s mental health/substance abuse treatment, social, and other treatment support needs; Monitor and evaluate the effectiveness of delivery of all services and supports identified in the Person Centered Plan. 2 Page 15a.2a The rehabilitative service activities of Community Support consist of a variety of interventions that must directly relate to the recipient s diagnostic and clinical needs as reflected in a comprehensive clinical assessment and goals outlined in the Person Centered Plan. These shall include the following, as clinically indicated: Identification of strengths that will aid the individual in his or her recovery, as well as the identification of barriers that impede the development of skills necessary for independent functioning in the community. Individual (1:1)interventions with the recipient, unless a group intervention is deemed more efficacious. Therapeutic interventions that directly increase the acquisition of skills needed to accomplish the goals of the Person Centered Plan. Monitoring and evaluating the effectiveness of interventions as evidenced by symptom reduction and progress toward goals identified in the Person Centered Plan. Psychoeducation regarding the identification and self-management of prescribed medication regimen, with documented communication to prescribing practitioner(s). Identification and self-management of symptoms. Identification and self-management of triggers and cues (early warning signs). Direct preventive and therapeutic interventions associated with the MH/SA diagnosis that will assist with skill building related to goals in the Person-Centered Plan. Direct interventions in escalating situations to prevent crisis (including identifying cues and triggers). Assistance for the recipient and natural supports in implementing preventive and therapeutic interventions outlined in the Person-Centered Plan (including the crisis plan). Response to crisis 24/7/365 as indicated in the recipient s crisis plan and participation in debriefing activities to revise the crisis plan as needed. Relapse prevention and disease management strategies. Psychoeducation and training of family, unpaid caregivers, and/or others who have a legitimate role in addressing the needs identified in the Person Centered Plan. Coordination and oversight of initial and ongoing assessment activities. Ensuring linkage to the most clinically appropriate and effective services. Facilitation of the Person Centered Planning process which includes the active involvement of the recipient and people identified as important in the recipient s life (e.g., family, friends, and providers). Initial development and ongoing revision of Person Centered Plan. Monitoring the implementation of the Person Centered Plan, including involvement of other medical and non-medical providers, the consumer, and natural and community supports. Effective coordination of clinical services, natural and community supports for the recipient and his or her family. 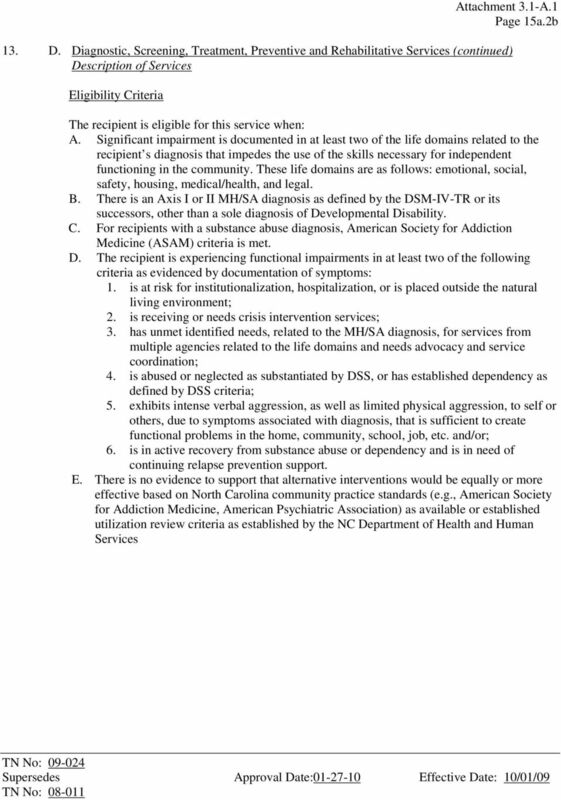 4 Page 15a.2c Continued Service Criteria The desired outcome or level of functioning has not been restored, improved, or sustained over the time frame outlined in the Community Support service goals in the recipient s Person Centered Plan; or the recipient continues to be at risk for relapse based on current clinical assessment, history, and the tenuous nature of the functional gains or continues to meet the utilization criteria established by the NC Department of Health and Human Services; One of the following applies: 1. 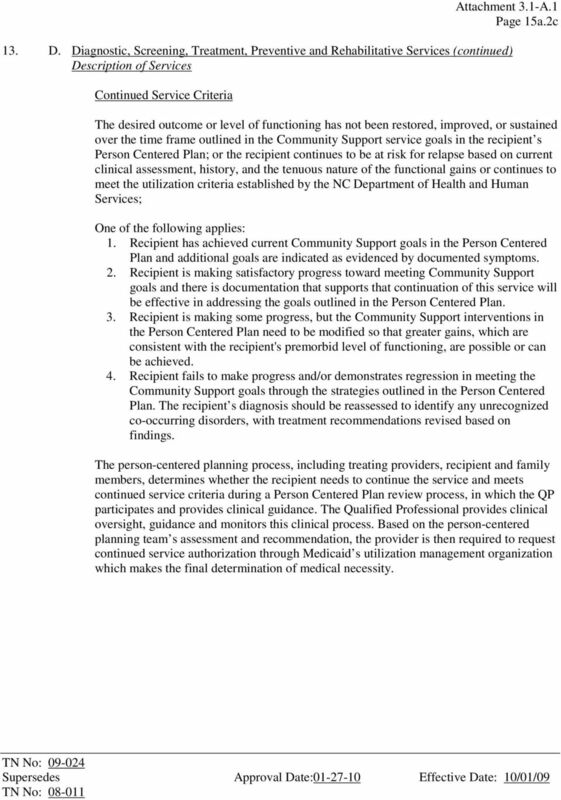 Recipient has achieved current Community Support goals in the Person Centered Plan and additional goals are indicated as evidenced by documented symptoms. 2. Recipient is making satisfactory progress toward meeting Community Support goals and there is documentation that supports that continuation of this service will be effective in addressing the goals outlined in the Person Centered Plan. 3. Recipient is making some progress, but the Community Support interventions in the Person Centered Plan need to be modified so that greater gains, which are consistent with the recipient's premorbid level of functioning, are possible or can be achieved. 4. Recipient fails to make progress and/or demonstrates regression in meeting the Community Support goals through the strategies outlined in the Person Centered Plan. The recipient s diagnosis should be reassessed to identify any unrecognized co-occurring disorders, with treatment recommendations revised based on findings. The person-centered planning process, including treating providers, recipient and family members, determines whether the recipient needs to continue the service and meets continued service criteria during a Person Centered Plan review process, in which the QP participates and provides clinical guidance. The Qualified Professional provides clinical oversight, guidance and monitors this clinical process. Based on the person-centered planning team s assessment and recommendation, the provider is then required to request continued service authorization through Medicaid s utilization management organization which makes the final determination of medical necessity. 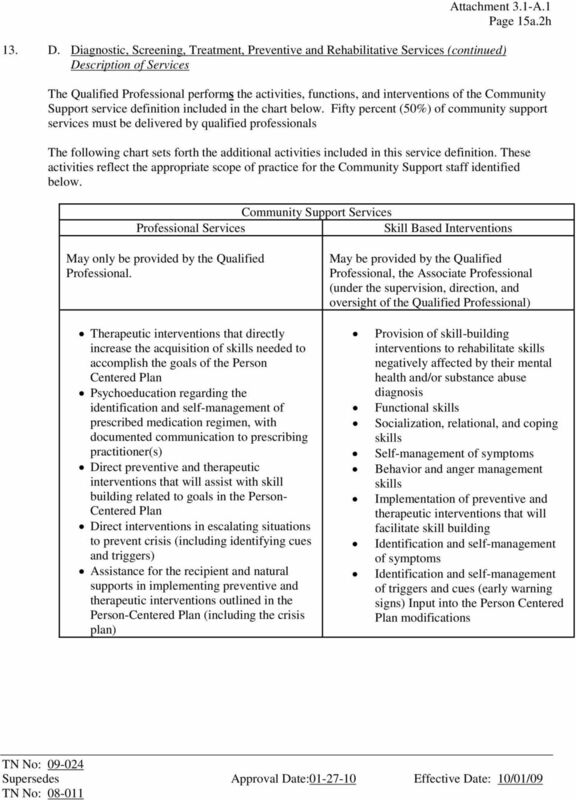 5 Page 15a.2d Provider Staff Qualifications: All staff that provides services must have 20 hours of training specific to the requirements of the service definition within the first 90 days of employment. 6 hours service definition specific training 3 hours crisis response training 6 hours Person Centered Thinking training QP staff responsible for Person Centered Plan (PCP) development - 3 hours PCP Instructional Elements training 2-5 hours in other topics related to service and population(s) being served. Training required for other purposes, such as Alternatives to Restrictive Intervention, client rights and confidential, infectious diseases and bloodborne pathogens may not be counted to achieve any of the 2-5 hours of additional training needed. Associate Professional (AP) within the mental health, developmental disabilities and substance abuse services (MH/DD/SAS) system of care means an individual who is a: (a) graduate of a college or university with a Masters degree in a human service field with less than one year of full-time, post-graduate degree accumulated MH/DD/SAS experience with the population served, or a substance abuse professional with less than one year of full-time, post-graduate degree accumulated supervised experience in alcoholism and drug abuse counseling. Supervision shall be provided by a qualified professional with the population served until the individual meets one year of experience. The supervisor and the employee shall develop an individualized supervision plan upon hiring. The parties shall review the plan annually; or (b) graduate of a college or university with a bachelor's degree in a human service field with less than two years of full-time, post-bachelor's degree accumulated MH/DD/SAS experience with the population served, or a substance abuse professional with less than two years of full-time, post-bachelor's degree accumulated supervised experience in alcoholism and drug abuse counseling. Supervision shall be provided by a qualified professional with the population served until the individual meets two years of experience. The supervisor and the employee shall develop an individualized supervision plan upon hiring. The parties shall review the plan annually; or (c) graduate of a college or university with a bachelor's degree in a field other than human services with less than four years of full-time, post-bachelor's degree accumulated MH/DD/SAS experience with the population served, or a substance abuse professional with less than four years of full-time, post-bachelor's degree accumulated supervised experience in alcoholism and drug abuse counseling. Supervision shall be provided by a qualified professional with the population served until the individual meets four years of experience. The supervisor and the employee shall develop an individualized supervision plan upon hiring. 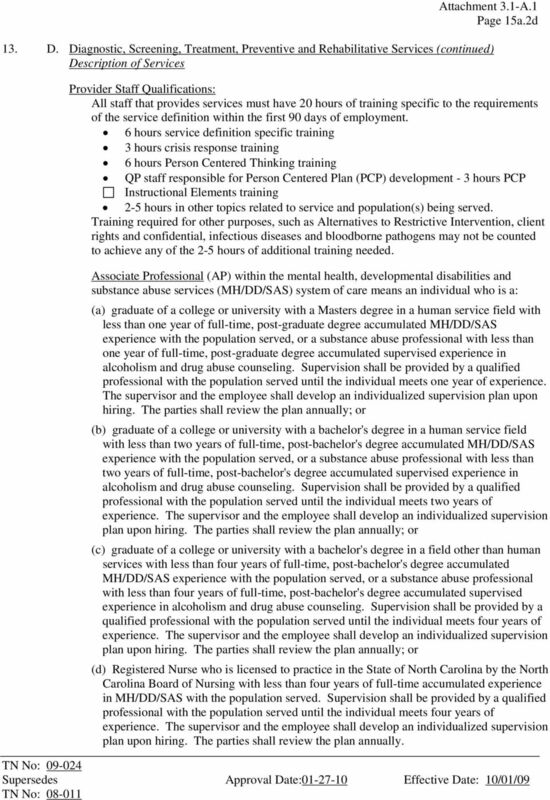 The parties shall review the plan annually; or (d) Registered Nurse who is licensed to practice in the State of North Carolina by the North Carolina Board of Nursing with less than four years of full-time accumulated experience in MH/DD/SAS with the population served. Supervision shall be provided by a qualified professional with the population served until the individual meets four years of experience. The supervisor and the employee shall develop an individualized supervision plan upon hiring. The parties shall review the plan annually. 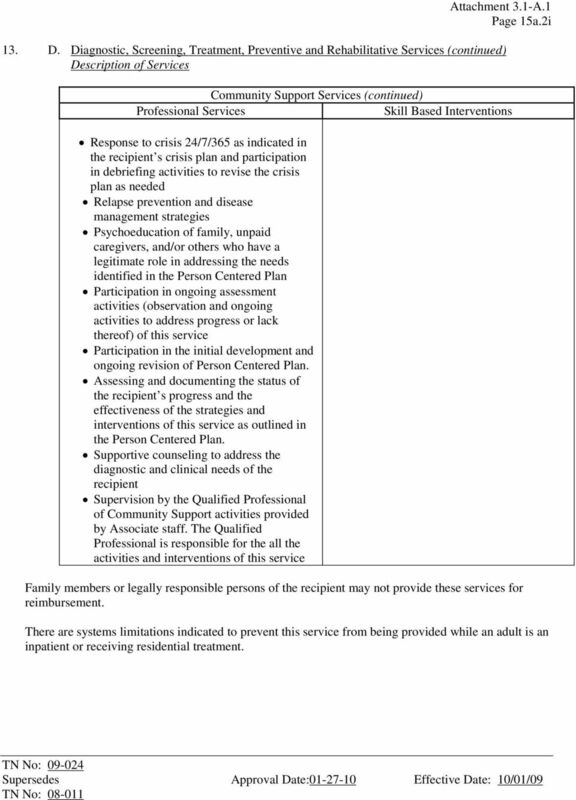 7 Qualified Professional (QP) means, within the MH/DD/SAS system of care: Attachment 3.1-A.1 Page 15a.2f (a) an individual who holds a license, provisional license, certificate, registration or permit issued by the governing board regulating a human service profession, except a registered nurse who is licensed to practice in the State of North Carolina by the North Carolina Board of Nursing who also has four years of full-time accumulated experience in MH/DD/SAS with the population served. 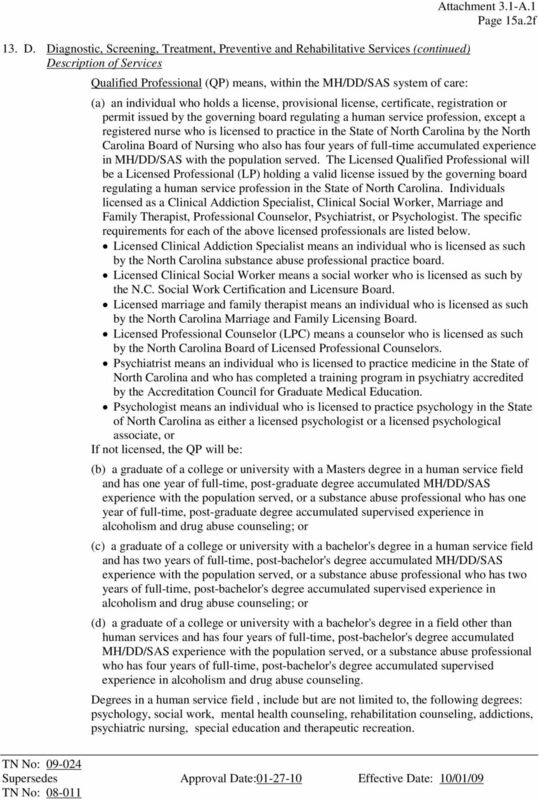 The Licensed Qualified Professional will be a Licensed Professional (LP) holding a valid license issued by the governing board regulating a human service profession in the State of North Carolina. Individuals licensed as a Clinical Addiction Specialist, Clinical Social Worker, Marriage and Family Therapist, Professional Counselor, Psychiatrist, or Psychologist. The specific requirements for each of the above licensed professionals are listed below. Licensed Clinical Addiction Specialist means an individual who is licensed as such by the North Carolina substance abuse professional practice board. Licensed Clinical Social Worker means a social worker who is licensed as such by the N.C. Social Work Certification and Licensure Board. Licensed marriage and family therapist means an individual who is licensed as such by the North Carolina Marriage and Family Licensing Board. Licensed Professional Counselor (LPC) means a counselor who is licensed as such by the North Carolina Board of Licensed Professional Counselors. Psychiatrist means an individual who is licensed to practice medicine in the State of North Carolina and who has completed a training program in psychiatry accredited by the Accreditation Council for Graduate Medical Education. Psychologist means an individual who is licensed to practice psychology in the State of North Carolina as either a licensed psychologist or a licensed psychological associate, or If not licensed, the QP will be: (b) a graduate of a college or university with a Masters degree in a human service field and has one year of full-time, post-graduate degree accumulated MH/DD/SAS experience with the population served, or a substance abuse professional who has one year of full-time, post-graduate degree accumulated supervised experience in alcoholism and drug abuse counseling; or (c) a graduate of a college or university with a bachelor's degree in a human service field and has two years of full-time, post-bachelor's degree accumulated MH/DD/SAS experience with the population served, or a substance abuse professional who has two years of full-time, post-bachelor's degree accumulated supervised experience in alcoholism and drug abuse counseling; or (d) a graduate of a college or university with a bachelor's degree in a field other than human services and has four years of full-time, post-bachelor's degree accumulated MH/DD/SAS experience with the population served, or a substance abuse professional who has four years of full-time, post-bachelor's degree accumulated supervised experience in alcoholism and drug abuse counseling. Degrees in a human service field, include but are not limited to, the following degrees: psychology, social work, mental health counseling, rehabilitation counseling, addictions, psychiatric nursing, special education and therapeutic recreation. 8 Provider Agency and Service Requirements: Attachment 3.1-A.1 Page 15a.2g The service will be provided by an endorsed community support agency. The endorsement process includes Community Support service specific checklist, and adherence to the following: Rules for MH/DD/SA Facilities and Services, Confidentiality Rules, Client Rights Rules in Community MH/DD/SA Services, Records Management and Documentation Manual for Providers of Publicly Funded MH/DD/SA Services, CAP-MR/DD Services and LMEs and, Implementation Updates to Rules, revisions and policy guidance. Providers enrolled in Community Support must be nationally accredited by one of the accrediting bodies approved by DHHS within one year of Medicaid enrollment. The agency must have a full time licensed clinical professional on staff. The community based service is provided by qualified professionals and associate professionals as defined on Attachment 3.1-A.1, Pages 15a.2d and 15a.2f of this State Plan Amendment. The service must be ordered by a physician, licensed psychologists, physician s assistant or nurse practitioner. The providers of this service will also serve as a first responder in a crisis situation. All Associate Professionals providing Community Support must be supervised by a Qualified Professional. Supervision must be provided according to North Carolina s supervision requirements and according to licensure or certification requirements of the appropriate discipline. These staff must also demonstrate compliance to the identified staff competencies. Non Post- Graduate degreed Qualified Professionals must be supervised by a Master s Level Qualified Professional, preferably Licensed. The Qualified Professional has sole responsibility for: Facilitation of the Person Centered Planning process for rehabilitative services which includes the active involvement of the recipient and others identified as important in the recipient s life (e.g., family, friends, providers). 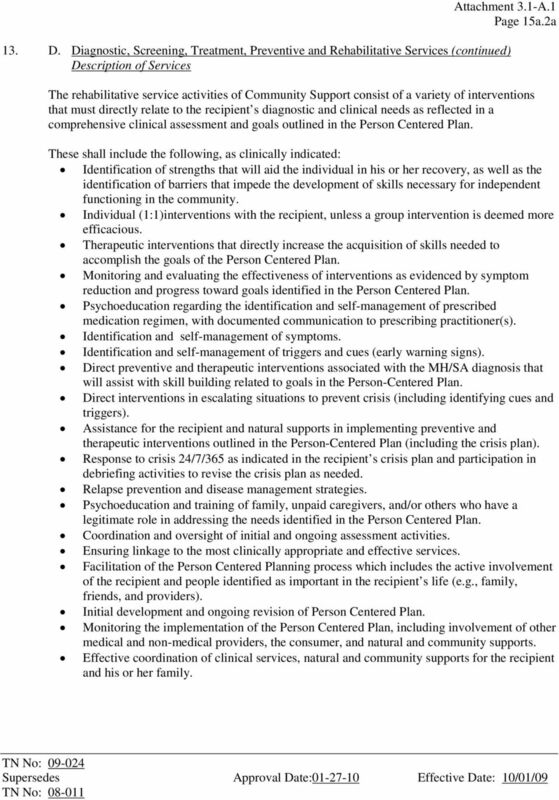 Initial development, implementation, and ongoing revision of Person Centered Plan for rehabilitative services. Monitoring and evaluating the effectiveness of interventions as evidenced by symptom reduction and progress toward goals identified in the Person Centered Plan for rehabilitative services. Coordination and oversight of initial and ongoing assessment activities. Ensuring linkage to the most clinically appropriate and effective rehabilitative services. 10 Page 15a.2i Community Support Services (continued) Professional Services Skill Based Interventions Response to crisis 24/7/365 as indicated in the recipient s crisis plan and participation in debriefing activities to revise the crisis plan as needed Relapse prevention and disease management strategies Psychoeducation of family, unpaid caregivers, and/or others who have a legitimate role in addressing the needs identified in the Person Centered Plan Participation in ongoing assessment activities (observation and ongoing activities to address progress or lack thereof) of this service Participation in the initial development and ongoing revision of Person Centered Plan. Assessing and documenting the status of the recipient s progress and the effectiveness of the strategies and interventions of this service as outlined in the Person Centered Plan. Supportive counseling to address the diagnostic and clinical needs of the recipient Supervision by the Qualified Professional of Community Support activities provided by Associate staff. The Qualified Professional is responsible for the all the activities and interventions of this service Family members or legally responsible persons of the recipient may not provide these services for reimbursement. There are systems limitations indicated to prevent this service from being provided while an adult is an inpatient or receiving residential treatment. 11 Page 15a.2j Utilization Management Services are based upon a finding of medical necessity, must be directly related to the recipient s diagnostic and clinical needs, and are expected to achieve the specific rehabilitative goals specified in the individual s Person Centered Plan. Medical necessity is determined by North Carolina community practice standards, criteria established by the NC Department of Health and Human Services and as verified by independent Medicaid utilization management vendor. Prior authorization is required for all community support. Units are billed in 15-minute increments, with the required modifier designating the level of the staff providing the service. Community Support Services are provided on an individual basis unless a group intervention is determined to be more efficacious. Community Support -- Group is defined as providing Community Support Services to a group consisting of no more than eight individuals. 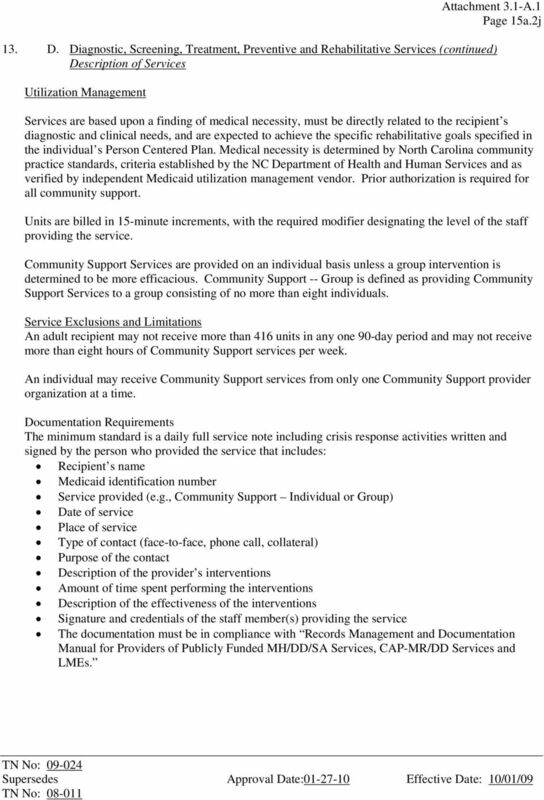 Service Exclusions and Limitations An adult recipient may not receive more than 416 units in any one 90-day period and may not receive more than eight hours of Community Support services per week. An individual may receive Community Support services from only one Community Support provider organization at a time. Documentation Requirements The minimum standard is a daily full service note including crisis response activities written and signed by the person who provided the service that includes: Recipient s name Medicaid identification number Service provided (e.g., Community Support Individual or Group) Date of service Place of service Type of contact (face-to-face, phone call, collateral) Purpose of the contact Description of the provider s interventions Amount of time spent performing the interventions Description of the effectiveness of the interventions Signature and credentials of the staff member(s) providing the service The documentation must be in compliance with Records Management and Documentation Manual for Providers of Publicly Funded MH/DD/SA Services, CAP-MR/DD Services and LMEs. CABHAs and non-cabha agencies may provide Comprehensive Clinical Assessments, Medication Management, and Outpatient Therapy. Enhanced Mental Health Original Effective Date: July 1, 1989 and Substance Abuse Services Revised Date: June 11, 2009. Other diagnostic, screening, preventive, and rehabilitative services, i.e., other. than those provided elsewhere in the plan. Attachment 3.1-A Limitation Supplement Page 6b. 13d. REHABILITATIVE SERVICES. 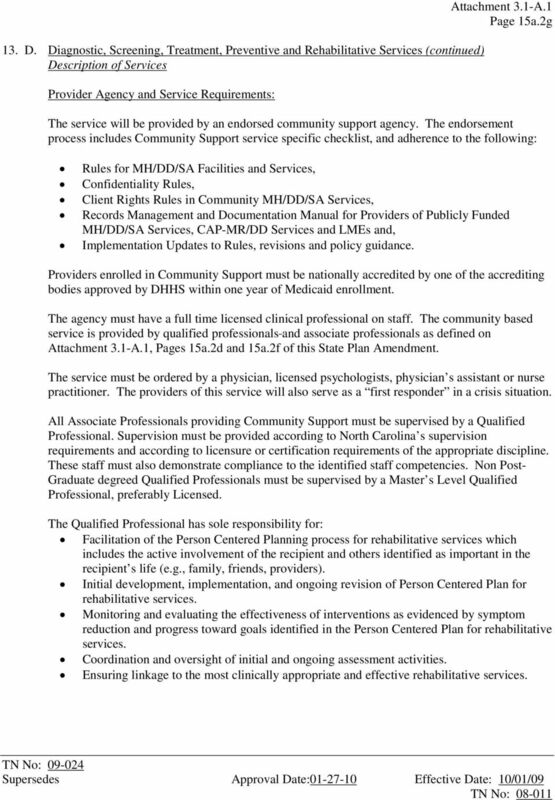 Professional Criteria and Medicaid Reimbursable Outpatient Services by Professionals The purpose of this document is to clarify who can provide which outpatient services to Iowa Plan Medicaid members. Item 4b: Early and Periodic Screening, Diagnostic and Treatment services for individuals under 21 years of age, and treatment of conditions found. 907 KAR 9:005. Level I and II psychiatric residential treatment facility service and coverage policies. Section 8 Behavioral Health Services Superior subcontracts with Cenpatico Behavioral Health Services, Inc. to manage behavioral health services (mental health and substance abuse) for Superior Members. Residential Rehabilitation Under the Medicaid Rehabilitation Option Frequently Asked Questions As of 12/17/04 ABOUT THE MEDICAID PSYCHIATRIC REHABILITATION OPTION 1. What is the Medicaid Rehab Option? Mental Health Skill-building Services (MHSS-H0046) November 2013 Disclaimer These slides are not meant to substitute for the comprehensive information available in the manual or state and federal regulations. 45:8B-34. 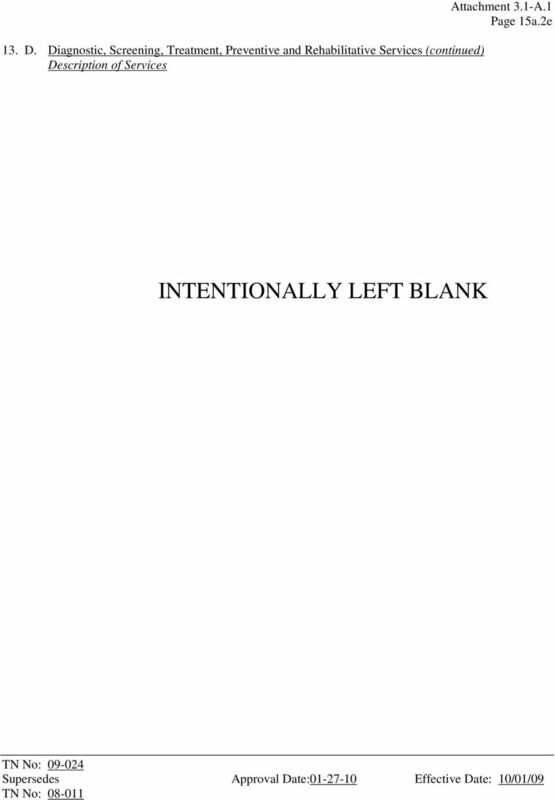 Short title 1. This act shall be known and may be cited as the "Professional Counselor Licensing Act." L.1993,c.340,s.1; per s.20 of 1993, c.340, act to expire if 45:8B-35. Determinations 2. Evidence Based Practice Continuum Guidelines The Division of Behavioral Health strongly encourages behavioral health providers in Alaska to implement evidence based practices and effective program models.